(Lighthouse Trails) For many years, Lighthouse Trails has written about the slide that Biola University in Southern California has taken into contemplative spirituality. Our first indication that the school was heading that way was in February of 2006 when we learned that Biola was actively participating in a publication called Conversations Journal, a magazine whose primary purpose is to bring contemplative spirituality to the church, and editorial involvement includes names such as Richard Foster, Basil Pennington (a Catholic mystic), Tilden Edwards (co-founder of the panentheistic Shalem Institute), and others of the contemplative viewpoint. Since then, we have watched as Biola has gotten whole-heartedly on the contemplative band wagon with its own Institute for Spiritual Formation through Biola’s Talbot School of Theology. Fast forward nearly twelve years to the fall of 2017 when the longstanding president of Biola, Dr. Barry Corey, took a month-long sabbatical leave starting with a week at the Glastonbury Abbey in Massachusetts (a Benedictine monastery) then wrote about his time of contemplative silence at the Abbey for the students of Biola in an article titled “The Abbey Makes Space for the Soul” in the school’s student-run newspaper Chimes. Of course, it makes sense to us that the president of a strongly contemplative university would spend time in silence at a Catholic mystical retreat center. 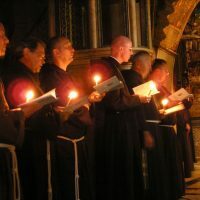 We have been explaining for many years now that contemplative prayer came to the evangelical church from the Catholic monasteries (e.g. Thomas Merton at the Abbey of Gethsemani in Kentucky). So naturally, a contemplative proponent such as Corey would be drawn to a Catholic contemplative retreat center. It’s like going back to the roots of what has become the foundation of Biola’s “faith.” And with the president himself boasting of his time at the Glastonbury Abbey, no doubt, many students will wish to follow suit. Most of them probably won’t have the money to take a week off and fly across the country to Massachusetts (college students are generally strapped for funds – Biola’s yearly tuition runs over $40,000 a year). But with President Corey’s glowing report of his time at Glastonbury, students can at least order a few books from Glastonbury’s online bookstore. Here are some titles Biola students might purchase from the Glastonbury bookstore: Becoming the Presence of God (Contemplative Ministry for Everyone) by Michael Ford, Finding Our Sacred Center by Henri Nouwen, Divine Dance: The Trinity and Your Transformation by Richard Rohr, Christ in All Things: Exploring Spirituality with Pierre Teilhard De Chardin, Guidelines for Mystical Prayer, What the Mystics Know: Seven Pathways to Your Deeper Self by Rohr, and a multitude of other similar books. The majority of the books in Glastonbury’s bookstore radiates with the contemplative message that God is in everyone. For those who are new to understanding contemplative spirituality, THAT is the foundation of contemplative prayer (i.e., Spiritual Formation) – God in everyone, which of course, if was true, then Christ died for us in vain as man would not need a Savior separate from himself. This is why we have given our lives up to warn the church about the infiltration of this panentheistic spirituality that now affects over 90% of the Christian colleges, universities, and seminaries. If contemplative spirituality (as promoted at Biola) is legitimate, then the Gospel is not needed, and those of us who believe in it are the worst of fools.